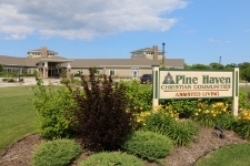 Pine Haven Christian Communities offer a full continuum of quality, compassionate care in a Christ-centered environment. Our flexible, innovative services and living options are tailored to meet the unique needs of our aging population. We welcome you to stop in, take a tour, join our activities - or contact us with any questions you may have. Thank you for your interest in Pine Haven Christian Communities. Or fill out the form on the right and we will respond as promptly as possible. Note: Rooms booked for an event must follow the guidelines found in our Agreement for Use of Pine Haven Facilities. Please send me a brochure. I would like to schedule a tour. Please call me. Thank you for your interest in Pine Haven Christian Communities! Someone will respond to your inquiry as promptly as possible.